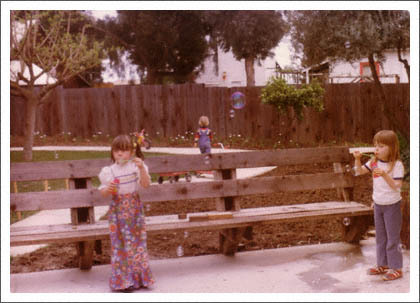 Since I've been mentioning all the old photos I had to scan, I thought I'd actually show you one. From left to right: my favorite cousin (in the flowery dress), the little brother (who appears to be running away), and me (nice shoes!). I'm off to the large Thanksgiving gathering at my grandparents, and Friday I'll make my way to San Francisco for the slightly smaller, belated Thanksgiving at my Mum's. I hope to have taken at least a few photos by the time I get back.